I dream that I live in an old stuccoed cottage in a Provencal village. I walk to the market with my basket and stop at the butcher shop where spicy sausages hang from the ceiling and a wooden box brims with stacks of plank-like dry salt cod. I remember the creamy brandade I purchased a week ago. I recall tender white pillows of fish in my neighbor’s tomatoey stew. Meandering on, I buy salad leaves from the greengrocer, a baguette from the bakery—then hike back up a stone cobbled path. Far from Provence, in American markets, I only occasionally see salt cod in small wooden boxes. As our ancestors learned long ago, salt not only preserves fish; it lifts the flavor of fish from bland to exquisite. Now that we’re being told to eat more fish and the price of fresh cod is often reasonable, it’s worth taking the little time to salt our own codfish at home. Codfish doesn’t need to be buried in salt, but it needs 1 ½ tablespoons of kosher salt per pound, a minimum of two days to cure—and yield a classic Provencal delicacy. * To prepare the cod: Sprinkle 1 pound fresh cod on both sides with 1 ½ tablespoons kosher salt. 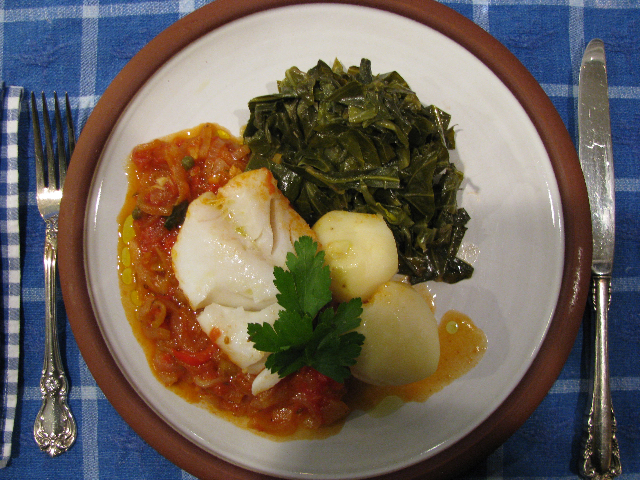 Place the cod on a glass plate lined with paper towel and store it in the meat drawer or on a fridge shelf. Leave the cod in the fridge 2–7 days to cure. You may detect a bit of fish odor the first day; then it will go away. When ready to use, soak the fish in 2 quarts cool water at least 1 hour for each day in the cure. You may soak the cod up to 24 hours in the fridge. Before cooking, pinch off a bit of the cod and taste (think sushi) for saltiness. Change the water occasionally but do not hasten the process by rinsing under warm water. Soak salted cod 2–24 hours, changing the water occasionally before cooking. Warm the oil in a heavy saucepan. Sauté the onion, fennel and pepper until limp. Add garlic, herbs and crushed red pepper. Sauté a few more minutes. Add chopped or hand-crushed tomatoes plus anchovy, capers, pinch of salt and sugar; simmer about 20 minutes or until reduced to a thick sauce. Cut the fish in portions, place on top of the simmering tomato mixture, cover and simmer 10–15 minutes or until fish is snowy white and just cooked through. Serve with greens, boiled potatoes and a drizzle of extra virgin olive oil. It’s almost always spring in Ireland. Soft rains green the fields, palm trees grow in Ballycotton and February 1st, St. Brigid’s Day, is spring’s unofficial first day. Daffodils bloom in January and brighten country lanes through March. Winter’s last gray snow may still greet us in the American Midwest on St. Patrick’s Day, but we’ll be thinking of Ireland and everything green. No doubt you’ll still find some sodden boiled dinners on the Emerald Isle today, but cooking for the most part has met higher European expectations. Travel in Ireland can mean dining as exquisitely as in France, and everyone speaks English. In many ways the food is even better than in France, with Irish emphasis on freshness, year-round availability of garden-to-table produce, and the nearness of both the sea and farmland. 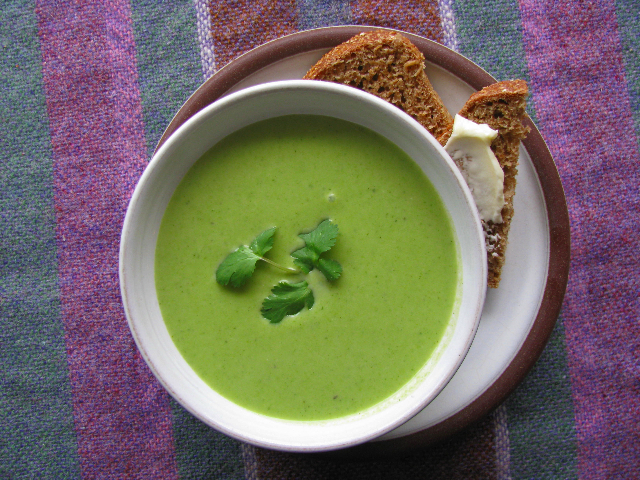 A simple way to bring the green to your March 17th table is with pea and coriander soup. You’ll need a package of frozen peas, some fresh cilantro and about 15 minutes in the kitchen to taste the goodness of today’s Irish cottage fare. *Coriander leaves, greens from the coriander seed plant are called both Chinese parsley and, commonly, cilantro in the U.S. In a medium pot melt the butter, sweat the onion, garlic, chili and coriander stems until soft and translucent. Add the stock, water, salt and sugar; Cover and gently boil 5 minutes. Add the peas, return to the gentle boil and simmer 5 minutes. Add the chopped coriander leaves. Cool a few minutes and puree the soup in a blender or use an immersion blender. Sieve the soup to remove pea hulls and enrich with cream for a more refined soup. Serves 4 as first course. Belle lived down the road in a big house on the hill. She had a circular driveway, a swimming pool and a sunken living room filled with plush carpet and curved velour sofas. When I was twelve, she called me over to baby-sit Victor, Carol and Kimberly. Late at night I fell asleep with Mozart on the stereo. Belle sometimes asked me to help with her luncheon parties when glamorous ladies gathered at umbrella tables around her pool. She served plates of peaches and melons with mounds of cottage cheese and slices of dark, spicy gingerbread. Belle’s gingerbread became the gingerbread of my dreams. 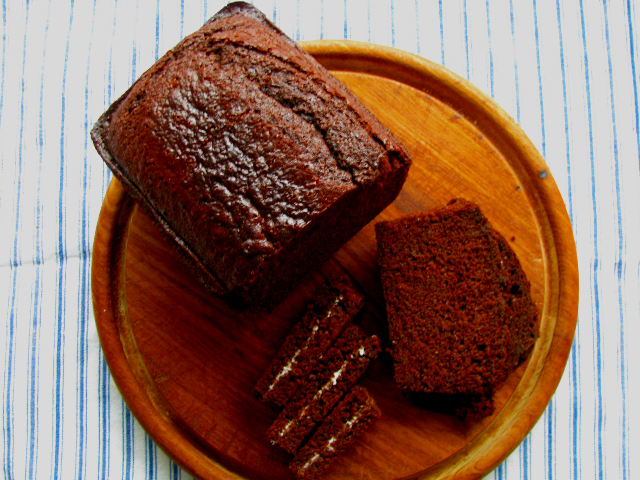 It’s richly spiced, not too sweet, always soft and moist. I still have her recipe copied out in my Palmer Method script on a small file card. Gingerbread was popular in colonial America as an everyday cake when molasses, sorghum and maple syrup were more common than refined sugar. Today Martha Washington might be surprised to find oil rather than lard in this recipe, but I think she’d be at home with the flavor of Belle’s gingerbread. Preheat the oven to 350°; grease a 9-by-5-inch loaf pan. Combine the molasses, boiling water and oil. Mix in the egg and pour the liquid ingredients into the well in the dry mixture. Stir together with a whisk until smooth. Pour batter into the prepared loaf pan and bake for 45–60 minutes or until tests done. Do not open the oven door until the gingerbread has baked for 45 minutes. Turn out onto a wire rack to cool. Gingerbread will slice more easily if allowed to rest in a covered tin for a day. Serve with soft butter or whipped cream. You are currently browsing the Mary Jo's Kitchen blog archives for March, 2011.